With a beautiful roast beef in my freezer and Friday approaching I decide I’m going to start with beef braised in red wine. I had all but one of the ingredients. Also red wine has been a hot topic recently in the Culinary world. Your finding it in desserts, hot chocolates pretty much everything we can thing of. My husband a fan of both red wine and beef is also in high favor. I’ve defrosted the roast. And started the marinade. I am taking the 24hr marinade route, as Julia suggests a few. Even one with the marinade ingredients simply added to the braising process. But I’d like to taste the difference. So every few hours I twirl the roast in the juices of red wine, brandy, olive oil. Seasoned with garlic, thyme, Bay leaves, parsley, salt and pepper. Soaking with celery, carrots and onions. 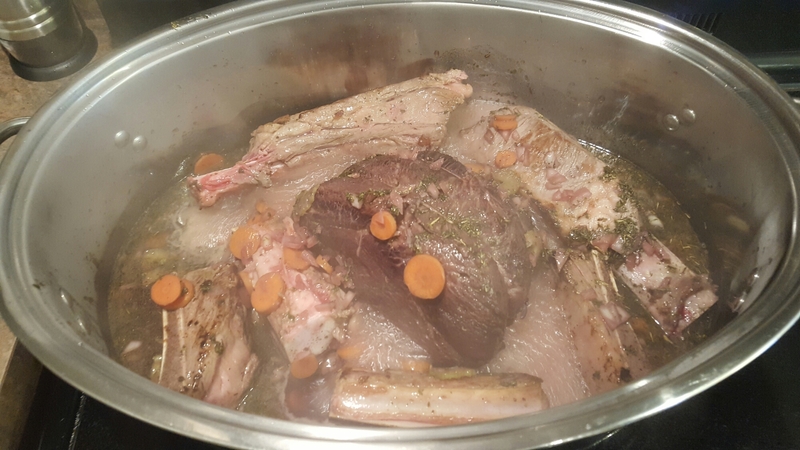 The braising, essentially the most important part has been more difficult then anticipated. The recipe calls from a veal knuckle and or calfs feet. After spending time with my Farm Boy butcher I’ve been assured that if I wanted a calfs foot I’d have to see a farmer. Hmmmm. She then assured me the best alternative is beef short ribs. The flavor she says will be very much the same. She picks them out of me. And marks the prices down. Then slaps on a sticker that says ‘mark down another 20%’. ‘These will shrink right down’ she says ‘so take enough.’ It’s good to have a butcher who knows their stuff. She tells me to come back and tell her how it works out. Her confidence made my nerves more steady. Hour 11. The roast has been marinating in the red wine and seasonings, twirled every couple of hours. The smell is the surprising part each times I open the lid it’s changed. It started over powered with the wine. But now the garlic and coves have started to work their magic. The bay leaves and parsley adding their aroma. Onion redolent that ties everything together. My confidence is beaming. 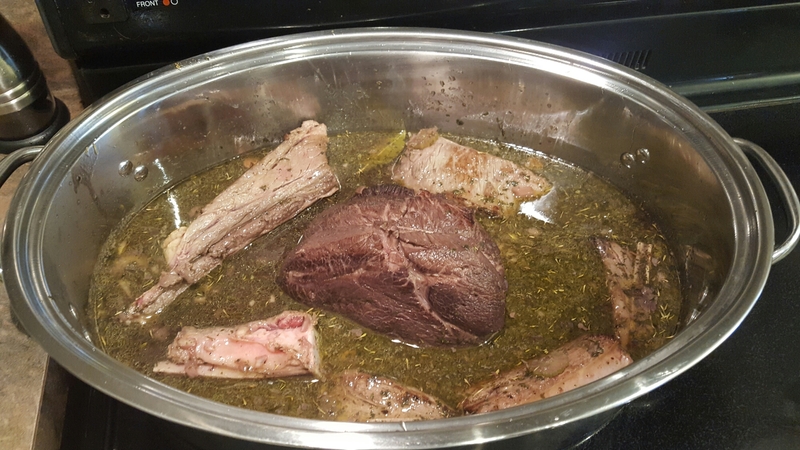 I brown the dried meat in the oil along with the short ribs just as I’m told from my butcher. Then I pour the wine marinade over the browned meat and boil down the mixture to about half. You see it boiling here. Then I added the beef stock and the bacon. Once at a steady low boil. I put the lid on tight and put it in my preheated oven at 350°. For 2 and a half hours. Turning fairly consistently. The smell of the house is almost a musk perfume. The flavor was unexpectedly complimentary, wine and beef. The onions flavor connect with the garlic. Leaving the beef with a savory flavor. Given the marinade time it was a superbly tender example of this recipe. Julia’s browning technique of drying the meat before browning worked like a charm. Locking in all the flavor of the beef, side ribs, and bacon. Paired with this beautiful piece of meat is pomme de terre chateau, a beautiful way of saying potatoes with butter.